Very often, a device called a router sits between the DSL or cable modem and your laptop or the rest of the network. The router (rhymes with chowder) is designed to provide an interface between the Internet and your local network. The router takes care of most of the more confusing networking options for you; plus, it provides firewall protection between the computers on your network and the rest of the wild, nasty Internet. Yea, verily, even in a wireless setting, the connection is the same. 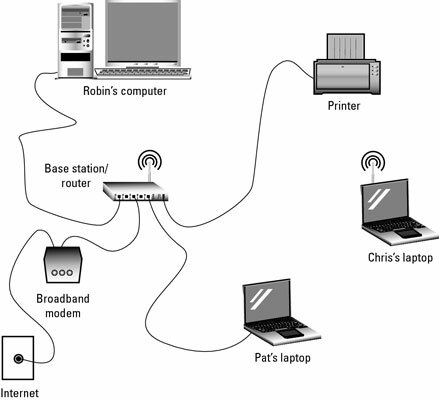 In fact, a wireless router connects by wire to the high-speed modem. Then the rest of the computers on the wireless network connect wirelessly to the router. The figure above illustrates the shocking, wireless difference. Routers are configured by logging in to them. 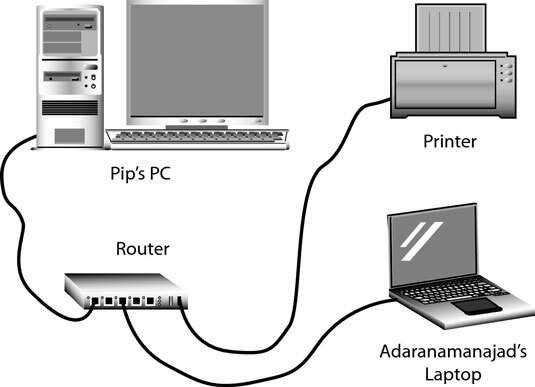 The router has an IP address, and you use your Web browser software, such as Internet Explorer, to connect to the router, log in, and set the configurations. Instructions for doing this come with the router.